Carpal tunnel syndrome is caused by a pinched nerve in the wrist and causes tingling, numbness and other symptoms in the hands and arms. Alpha-lipoic acid is an antioxidant found naturally in the body that also comes in supplements. Alpha-lipoic acid in combination with gamma-linolenic acid has been found to be effective in treating carpal tunnel syndrome. Vitamin B6 deficiency may be related to carpal tunnel syndrome, and its antinociceptive properties may reduce sensitivity to pain. Vitamin B6 also reduces pain because it treats conditions that damage the peripheral nerves. Vitamin B6 can be found in fish, beef, poultry, starchy vegetables and some fruits and can also be found in a supplemental form. Magnesium improves muscle relaxation and nerve function. Magnesium can be found in green vegetables, grains or legumes, but it can also be purchased in supplement form. Magnesium may cause loose bowel movements, but simply reducing the dose typically remedies this side effect. Inserting needles in pressure points in the hands, wrist, arm and thumb area along with the neck, upper back and leg can reduce carpal tunnel pain. Doing so increases circulation in the body and releases pain-relieving chemicals in the body. The effectiveness of acupuncture is determined by the overall health of an individual, symptoms, symptom intensity and how much a person uses their arms and hands. Yoga postures that promote the stretching, strengthening and balancing of upper body joints can reduce carpal tunnel pain. It should be done regularly in order to benefit fully from its results. 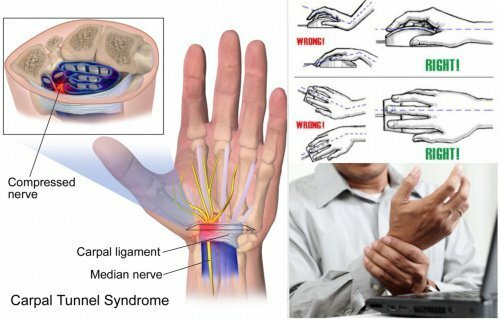 Movements that cause discomfort around the areas affected by carpal tunnel syndrome can be altered or avoided completely to prevent injury.